Full 40 storeys tall, with a 12-storey podium, a new condo project by Great Gulf at 5 Lower Sherbourne St in Toronto, between Sherbourne Common and Bonnycastle St. With its “Gardens in the Sky” design philosophy, will be a landmark for the new waterfront neighbourhood of East Bayfront that will set the standard for design excellence and sustainability. Located north of Queens Quay at 12 Bonnycastle Street, Monde Boardwalk Condominiums is the first private sector development in East Bayfront – a vibrant “new blue edge” community defined by extraordinary design, award-winning parks and public spaces. 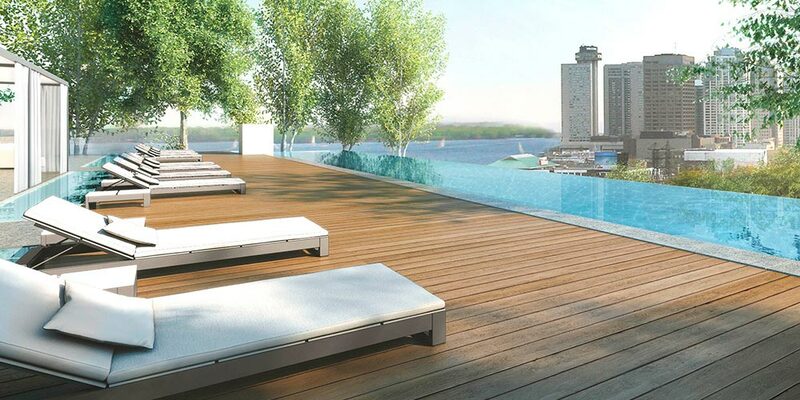 Boardwalk Suites starting from $288,000. In the heart of Toronto’s newest and most dynamic waterfront community, Great Gulf’s Monde Condominiums is releasing a new set of units entitled “Boardwalk Suites,” which embody a waterfront lifestyle, inspired by nature, the lake and city. Boardwalk condos offer fantastic lake and city views and are at the steps of all that the new waterfront offers, allowing residents to live in an urban setting that is surrounded by nature. These modern suites offer views of Lake Ontario and Toronto’s iconic skyline and include pre-finished engineered flooring throughout; Cecconi Simone -designed kitchens and bathrooms; and much more. Monde Condominiums also borders on a brand new water’s edge boardwalk, is steps away from Sugar Beach and just south of The Distillery District. Monde Condominiums is the first residential project that world-renowned architect Moshe Safdie has done in Canada since his landmark Habitat ’67 in Montreal. His works are known for their dramatic curves, geometric patterns, use of windows, and placement of open and green spaces, and this signature style is apparent in Monde Condominiums. What’s more, Monde Condos is one of very few residential buildings in Canada pursuing LEED Gold certification, paying homage to its surrounding environment. On the 10th floor, Monde Condominiums has devoted more than 16,000 square feet to resort-style amenities, including an infinity pool surrounded by white cabanas; a lush outdoor garden with mature trees; a fire pit; an indoor fitness and spa; and much more. Throughout the building, the new broadband infrastructure from Beanfield is up to 100 times faster than internet service anywhere else in the city.